Smothered in voluminious white bloom all along its branches. 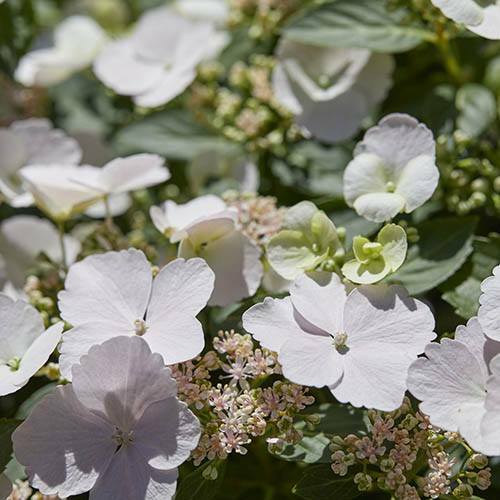 An explosion of snow-white flowers in your garden all summer - from one of the newest and most desirable of the recent hydrangea introductions. 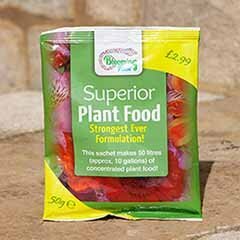 Awarded the prestigious title of Plant of the Year for 2018 at the RHS Chelsea Flower Show and it's easy to see why! 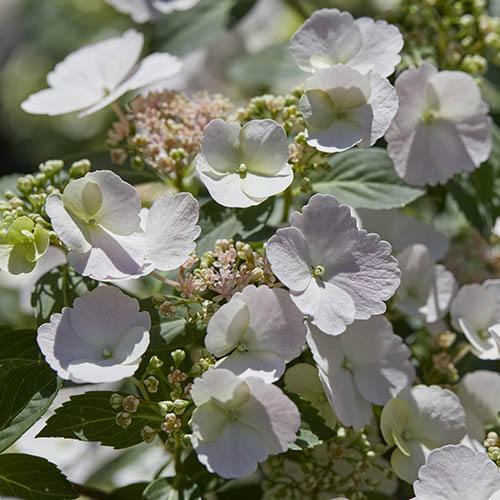 A unique blooming habit, 'Runaway Bride' forms trailing garlands of flowers on new wood, hence its name the 'Garland Hydrangea' - a real breeding breakthrough. 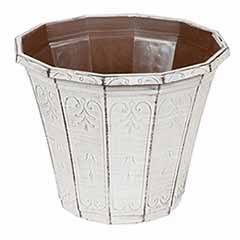 Compact, perfect for pots and even baskets. 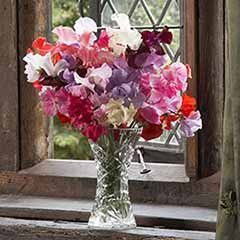 Easy to grow and a breeze to maintain, no wonder they're one of the UK's most popular flowers! 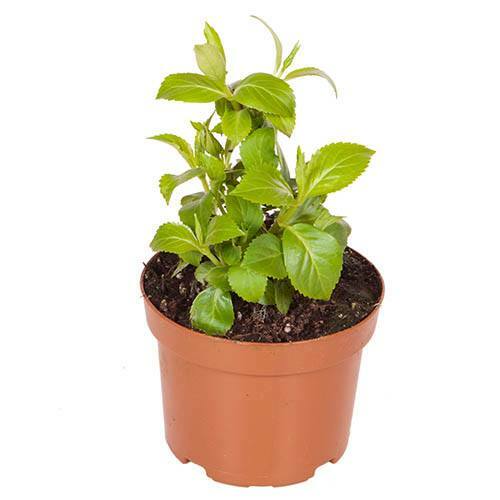 Supplied as an established plant in a 10.5cm pot. 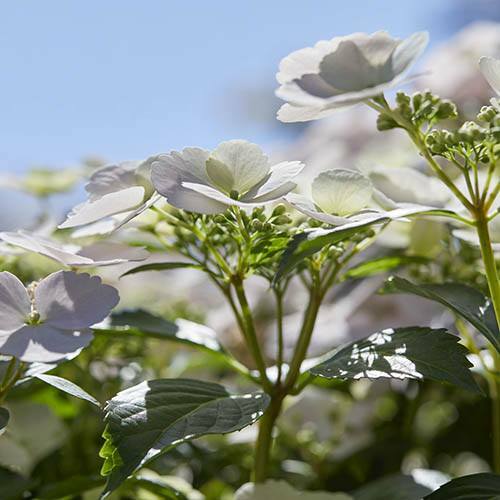 Just imagine, an explosion of snow-white flowers in your garden all summer - from one of the newest and most desirable of the recent hydrangea introductions. 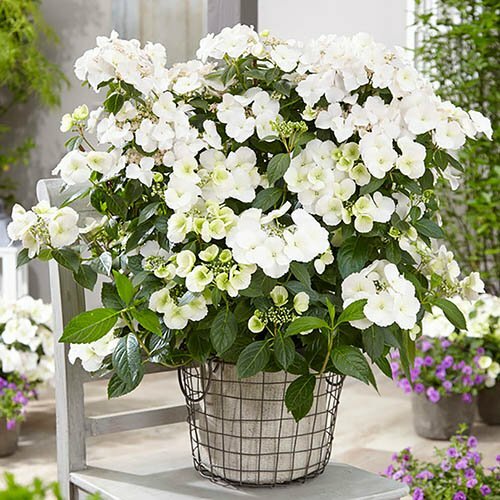 This is your opportunity to get your hands on this brand-new hydrangea which was awarded the prestigious title of Plant of the Year for 2018 at the RHS Chelsea Flower Show and it's easy to see why! 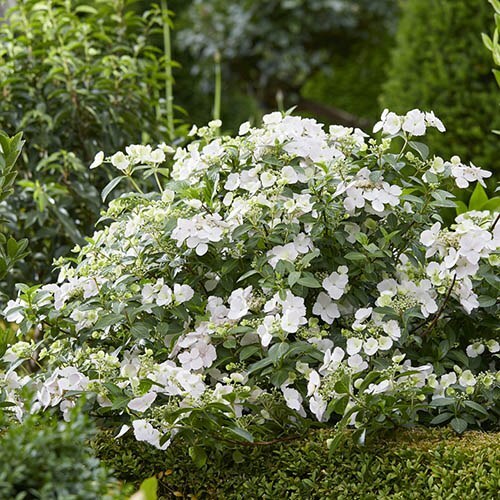 With a unique blooming habit, 'Runaway Bride' produces snow-white flowers along the length of its branches which can take on an attractive pink tint as they age. 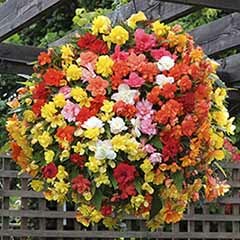 This is a real breakthrough for hydrangeas which normally flower at the tips of shoots only. 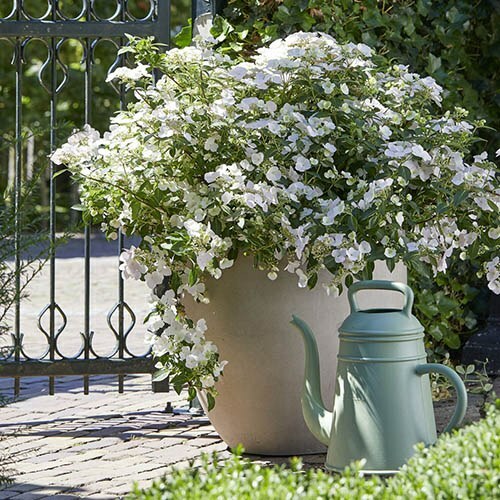 The profusion of white lace-cap blooms gives this hydrangea its common name of the 'garland hydrangea' and the flowerheads themselves create a light, airy feel - making them ideal as a centrepiece in pots and even hanging baskets - there seems to be no end to its talents! 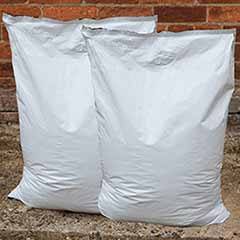 Also, and an absolute bonus in our opinion, the flower colour does not change with the pH in your soil - they're always white! 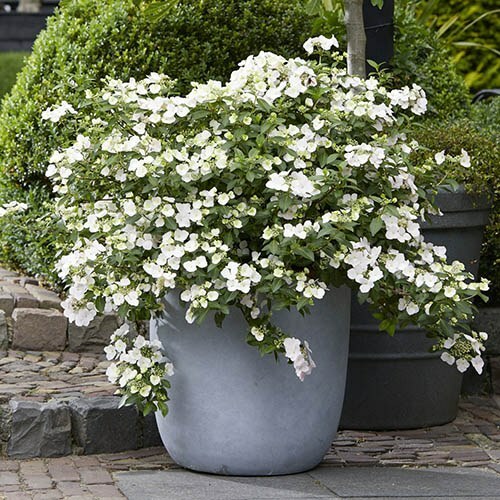 This hydrangea is sure to become an exceptional garden favourite, so get yours now and become one of the first to grow it. 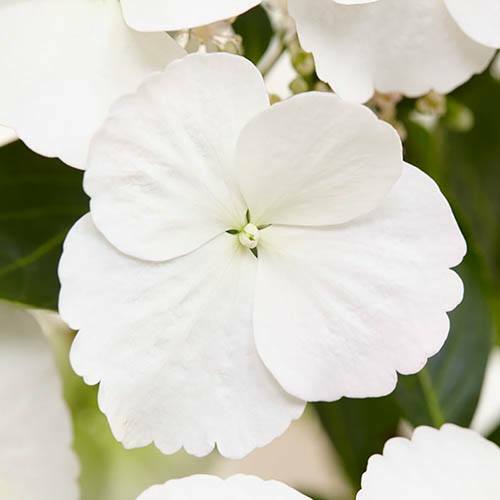 Introduced at the premier UK flower show, Hydrangea 'Runaway Bride' was bred by world-renowned expert Ushio Sakazaki who also brought us trailing Surfinia Petunias, so this is a hydrangea with a superb pedigree. Bang on trend as cut flowers or winter displays, hydrangeas are known the world over for their heads of gorgeous flowers, they're easy to grow and a breeze to maintain, no wonder they're one of the UK's most popular flowers! 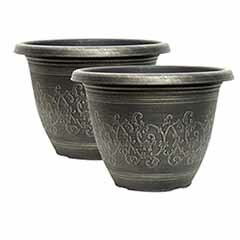 Eye-catching in pots and planters on the patio or decking, the flowers dry on the plants and retain their appeal for a very long time, often until the middle of winter and you can even use the flowers in dried flower arrangements. 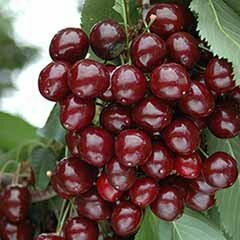 Supplied as an established plant in a 10.5cm pot, ready to be planted straight out. Hydrangeas do not like to dry out. 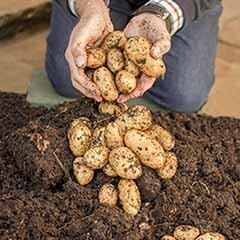 In dry weather, soak the roots with a hose and the plant will usually recover, and in any case, water regularly until plants are fully established. 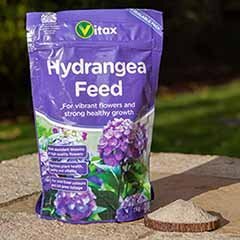 Really low maintenance - just plant in position, water well, and add some fertiliser - they’ll burst into growth and flower profusely all summer! 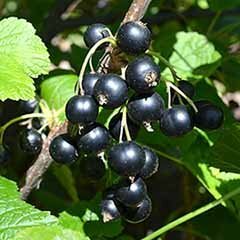 This plant is at its best in a compost-enriched, moist soil as long as it is well drained, in sun or partial shade. 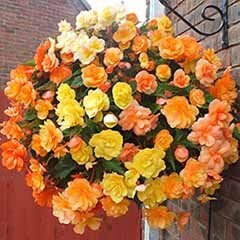 Can be planted in sun or light shade. 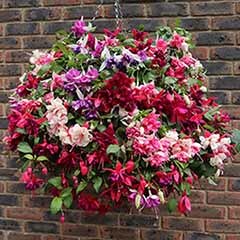 Hardy in the UK, frost can cause a lot of damage to young buds, reducing the number of flowers, so it’s advisable to protect your plant with fleece if freezing weather is likely. Remember to water regularly and deeply. Leave the faded hydrangea flower heads in place until the new buds swell in spring to protect the delicate new shoots from frost damage - they look gorgeous covered with frost, and of course they'll provide shelter for overwintering wildlife. 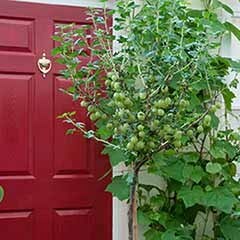 Cut back the flowered stems to a strong pair of buds in early spring. 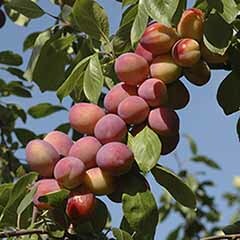 Remove any branches that are damaged or dead as well as any that are misplaced. 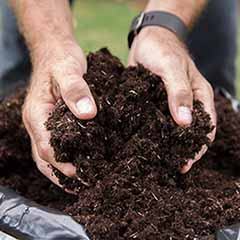 After pruning hydrangeas, apply a mulch of well-rotted manure or compost around the base of the plant. 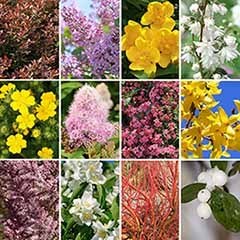 Once established, remove a quarter to a third of the shoots to the base of the plant each year to encourage the production of new, replacement growth that will carry more flowers.